The new season is playing out exactly like no one thought. Preparing for the 2019 Monster Energy AMA Supercross series I was confident that either Ken Roczen, Eli Tomac, Jason Anderson or Marvin Musquin would have secured at least one win within the first two rounds. I probably would have wagered the shirt off my back if anyone was willing. I’ve been watching Supercross my entire life, and haven’t witnessed a series with this much parity since 1990. Usually, heading into round three we already have an idea of who the favorites are and the direction of the series, but this year I’m even more confused as we enter round three. Up is down and left is right...what is going on here? Blake Baggett did the unthinkable at Glendale and I’m not talking about winning. Blake passed Jason Anderson on the outside and stayed upright! Anderson has owned Blake the last few years, demonstrating his dominance every time they get close. Anderson mysteriously crosses lines and Blake is suddenly on the ground. They’ve grown up racing each other, but in 2017 Blake made some bold comments after winning the Colorado round of outdoor motocross and Anderson has made him pay for those comments, over and over. When Blake went around Anderson on the outside, if you look closely you can see the monkey being launched off Blake’s back. 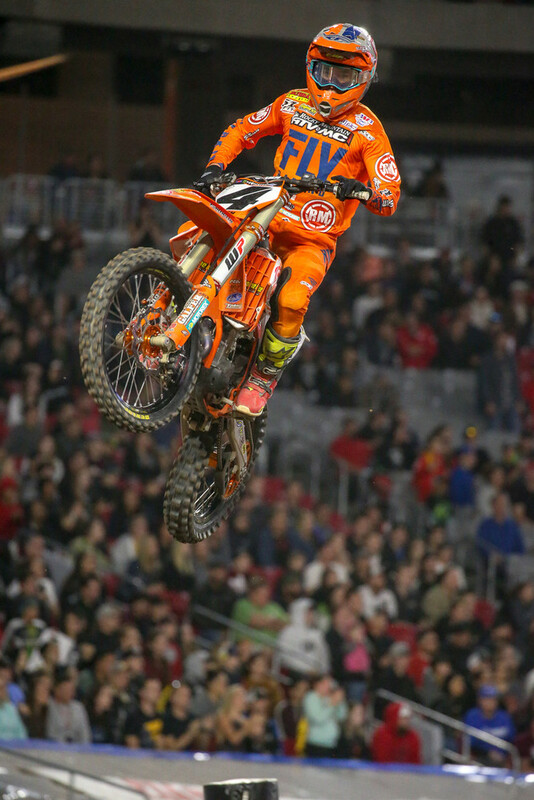 Jason Anderson was a big question mark heading into Glendale. 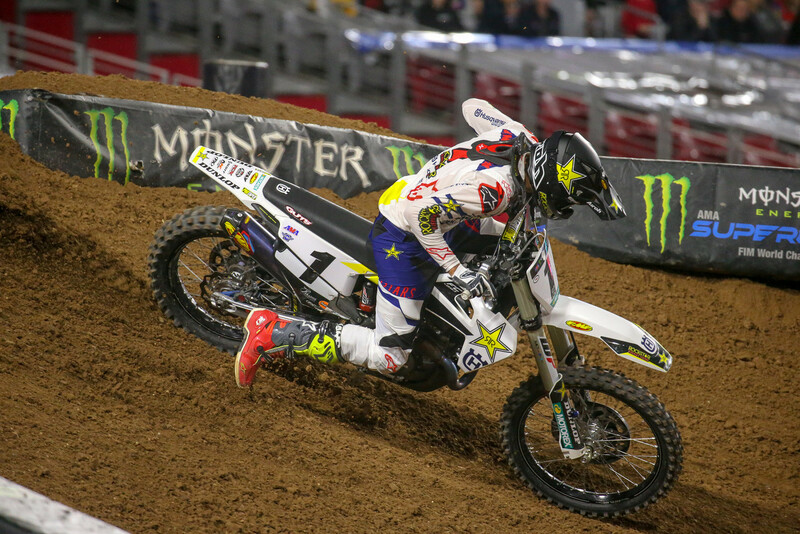 His ride at Anaheim was not what we expect from a defending champion. Rumors were flying as to why his race went bad, I heard he was suffering from an offseason wrist injury, I heard his bike suffered an electrical issue and some ridiculous theories about his off-track lifestyle. After seeing his performance at Glendale, I am convinced he is recovering from some sort of injury or illness as his fitness isn’t where it was in 2018. Teams make mistakes when they are secretive or deceptive about what’s going on with a racer. In this day and age of instant information, we find the truth, hiding or lying about issues only piques our curiosity. Supercross teams need to change with the times, in the 1990s or early 2000s they could easily manipulate the information released. NEWS FLASH! You can’t fabricate a narrative anymore. Everyone has a platform and the truth always surfaces, the best option for addressing issues and problems is transparency. The only guy doing exactly what we expected is Ken Roczen. With two podium finishes, he now has the red plate. Ken looked to be headed toward his first win since 2017 until the race was red flagged so the Alpinestars Mobile Medical crew could attend to Malcolm Stewart. Early reports have Malcolm suffering a concussion and broken femur, while we never want to see anyone get hurt this one really affected the season. Malcolm is one of the most likeable riders in the paddock and looked like a contender prior to the injury. The sport needs more personalities like Malcolm, as he isn’t afraid to let his personality shine. I really hope the MCR team can find funding to bring him back and try this again in 2020. The Glendale track, much like Anaheim, was glorious! Multiple lines and 180-degree turns allowed for passing and in Anderson’s case block passing. Before you burn Anderson at the stake, I want you to look at Roczen’s line. Roczen was squaring up the corner and needed to be aware Anderson was there. It was an aggressive move, but not dirty! Had that not been the beloved Ken Roczen, his move would be a non-issue. Unfortunately, Roczen is the epitome of class and getting aggressive with him is like Kanye West ripping the mic from Taylor Swift. If Anderson did this to Vince Friese he would be cheered, I don’t have a problem with the move. 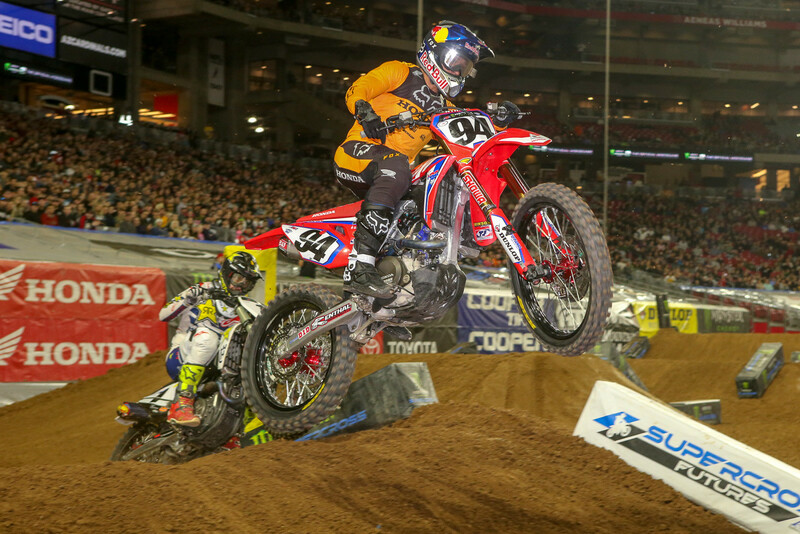 This isn’t golf, and Supercross is not for the faint of heart. 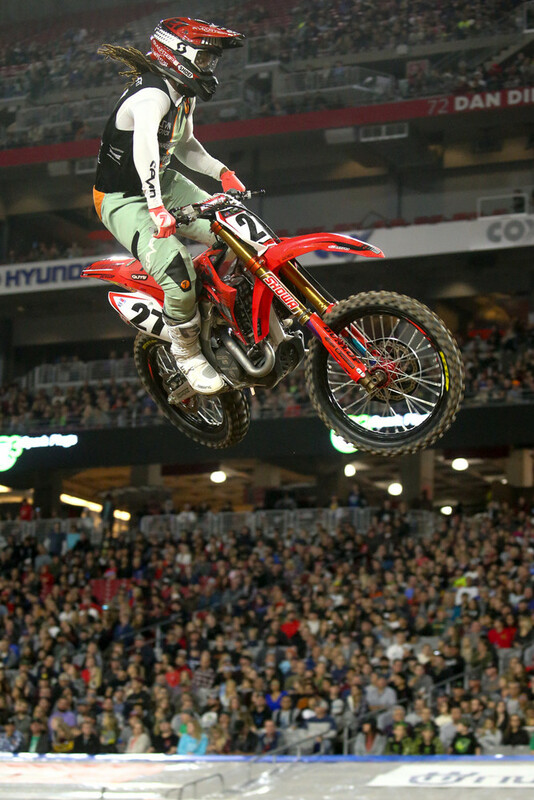 Typically, leaving Glendale we are talking about Eli Tomac and his alien-like speed, but last night he had one of those head-scratching moments where he slowed down for no apparent reason. Fortunately, for Eli it happened in the heat race. He slowed and looked at his rear wheel but there didn’t seem to be a problem. He did however manage a fourth-place finish in the main and is four points out of the series lead. I like this feature. Chris, what kind of background do you have? Thanks! Here is the paragraph from my first article on Vital: Chris Cooksey is life-long motorcross enthusiast, racing professionally in arenacross, motocross and supermoto. Chris obtained his degree from Arizona State, majoring in business and communications. After college Chris immersed himself in the business and social media aspects of the industry. Chris enjoys sharing his opinions ranging from on the track racing action to the mental health of riders and fans, including sharing his personal mental health journey. Sit back and enjoy the view from his perspective. Barcia winning A1, he's an aggressive rider and has always done well in the mud. Some of the front runners had issues early, he capitalized and rode great. Anderson is clearly nursing a late off season injury and trying to ride himself back into shape, he will be back in the next few rounds and a title threat for the long run. Baggett win was a fluke, he won't have another one this season. Just like his outside wall pass in Colorado against Tomac he has flashes of freak speed but won't back it up. Roczen is doing exactly what he needs to do, staying consistent, showing speed and running up front when he can. Tomac is being Tomac, his A1 ride back to a late podium was very impressive. He randomly has off nights or weird "slow down" moments and this is why he hasn't won the title in recent years. However, if on his off nights he can continue to get 3rds and 4ths we know he has the speed to leave people in the dust at a few rounds and he could end up wrapping this thing up without a big crash. Good analysis, I believe your info only backs up the randomness of 2019 or “confusion”. Would you have bet that both Barcia and Baggett would win before Roczen, Tomac, Anderson or Musquin win a single event? If I predicted the season would start like this in a preseason preview I would be mocked unmercifully... So a little confusing. Thanks for reading, I am simply sharing my opinion and am open to changing it with new information. I had Barcia pegged for winning A1 so partially yes, did I think Baggett would’ve been the other winner? No I didn’t predict it would be him specifically but the first 1-5 rounds are also usually somewhat of a crap shot. Tomac usually doesn’t come on strong until after Dallas, Musquin is nursing the knee injury, and Anderson the wrist so I didn’t predict any of them having wins yet and while Roczen is my favorite rider I’m happy he is starting slower and consistent. Baggett getting a win isn’t unheard of he has knocked on the door in years prior so again, not talking down I just haven’t found any of it to be that confusing. It’s not like Jo Blow 376 is out here stomping podiums out of no where. Either way I always appreciate the read and good content, so thank you! I love this week's title, ha!